Internet radio is a phenomenal development, with its most desirable feature being its lack of geographical barrier. 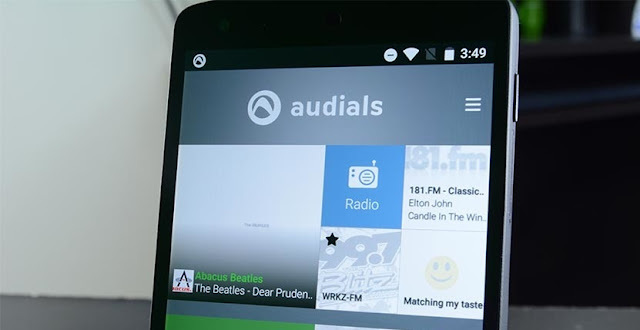 Resources like TuneIn, iHeart Radio, Soma.fm and Pandora might be the trending names, but one name that should be given more than a casual look is Audials radio. Comparing it with many other internet resources that have made waves, I discover that it is equally a solid app, and competes favorably. guess you are probably asking why it is a great option for internet radio. Well, Audials Radio is essentially a regular radio app and it also offers other apps in its store. The radio app has series of over 90,000 Internet radio stations from various countries across the globe. It also has talk radio, music radio with different genres and great programs. Audials Radio app enables users to select their favorites from a list of 90,000 international, national and even local Web radio stations. Like most other radio apps, this too includes a song recorder function. A click on the "Record" button will record only the music file and save music played by the Internet radio. Audials Radio cuts the music from the Web radio stream and avoids saving commercials. Furthermore, ID3 tags as well as cover images are automatically added to recorded music files. With the history you can play back your favorite songs at any time over and again. These songs are stored on your device and you can rename it and move it to any folder as you please. These files can also be played by other music players. The app also arranges your saved music into a playlist and can play them too, so in a way it doubles as a music player which I think is just fab! Wake Up to your favorite Internet radio station! This app will not just act as an alarm, but will wake you up with music from your favorite Internet radio station. It's pretty easy. Just set the time and the alarm will go off with whatever Web radio station you choose. It also includes a snooze function. A sleep timer is included as well to enable you set a time limit which allows the app to keep running until the limit runs out. With Audials Radio app, you can access mobile entertainment with more than 100,000 Podcasts ranging from news, documentaries and current affairs to language courses, tech reviews and comedy. Audials covers an extensive range of entertainment with thousands of podcasts. It might sound too good to be true, but it isn't. You can adapt the sound for every amplifying system or headphone. This equalizer is 5-band, and you can quickly change the sound based on the station and song. The app also has light and dark theme switcher so you can change according to your mood and preference. This app is one of the few that comes with both AirPlay and Chromecast support. Audials can stream music to airplay receivers which is a very rare feature for an Android app. It works perfectly and the Chromecast streaming is also equally reliable. First of all, Audials Radio has a pretty cool user interface; it makes using it simple and just less stressful. The features are easy to access on the interface. You have the option of creating an account if you wish to. I mean, the app works perfectly regardless of whether you have an account or not. And to me, that's a plus. If you have it on your desktop, it has a sync feature that allows you merge your mobile and desktop versions provided you create or have an account. The minute you open the application, all you have to do is look through the various stations and choose the one you would like to listen to. You can also search for other stations using keywords or frequencies. It only takes a few seconds for the audio to start streaming. I like that part. An offer provided for free on the Website of the producer is the Audials Live Web. It represents the largest directory of local, national and international Web radio stations. Moreover, a large range of podcasts in different languages is provided. In this database, music fans simply type in the artist name, genre, song or podcast title and will get a list of results to choose from and listen to directly in their browser.